A show home is open from 2 pm to 4 pm every Saturday and Sunday for Parkside Lifestyle Townhomes, a new townhome project located at 2109 13th Street in Courtenay. Come by, take a tour and find out why Phases 1 and 2 of this development are sold out. Parkside Lifestyle Homes are now accepting reservations on Phase 3, which includes eight new townhomes. Each new Parkside townhome is Built Green Canada Certified. This means that environmentally conscientious planning practices and construction techniques have been implemented in all stages of construction and development to reduce pollution, lessen the depletion of natural resources, and ensure a healthy and energy efficient living space for you and your family. A Built Green home reduces maintenance and repair costs and offers efficient heating and cooling costs. Built by experienced and award-winning builder, Nicon Developments Ltd., these homes are built for you to enjoy for years to come. Phase 3 includes eight units, which includes two duplex units and a four-plex. The two-storey homes are spacious in size and include 1,220 square feet of living space. Each of the new townhomes includes 3 bedrooms, 2.5 bathrooms, a bright open style living room and kitchen, a gas furnace, gas BBQ hookup, six appliances, window coverings, a garage, two outdoor patios, over-sized crawl spaces, landscaping and even guest parking! Bring your cat or dog to your new home as this development is pet-friendly! Enjoy sitting on your front porch and talking to the neighbours or enjoy barbecuing and socializing in your own private backyard. You are also located close to the downtown area of Courtenay and within walking distance of many trials, parks, shopping and other amenities. 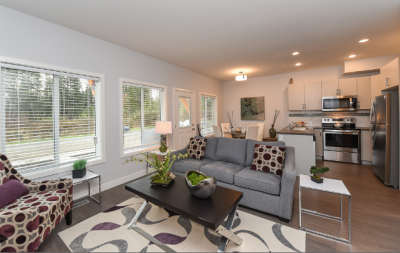 Contact Realtor Art Meyers for a private tour and he would be happy to show you these beautiful and spacious new townhomes for sale in Courtenay. This 2,159 sq. ft. home features 3 bedrooms, 3 bathrooms, a gas fireplace and a bright and sunny kitchen with quartz countertops. 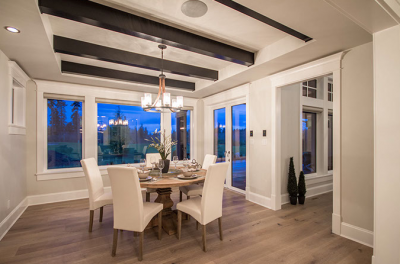 The open concept living space features a large living and dining room. The master bedroom is on the main floor. Two more bedrooms, a bathroom and large family room (21’ by 14.9’) are located on the second floor. Additional features include a two garage, a heat pump and hardiplank exterior finishing. 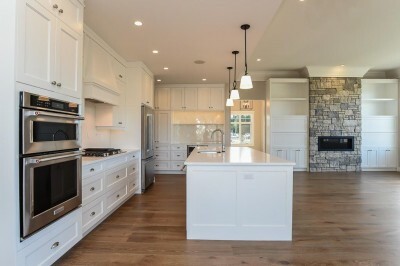 This beautiful home has been completed and is ready for occupancy. Price: $629,000. 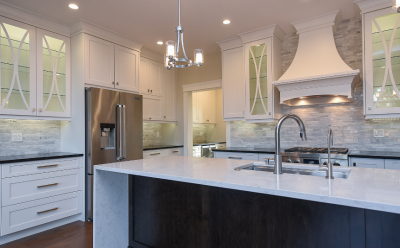 Brando Construction Ltd. is a local, reputable company dedicated to building quality homes. The Brando Construction crew values excellent craftsmanship and aims to always exceed expectations. 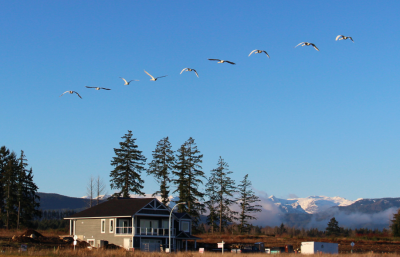 They have built over 25 homes at The RIdge, one of the most scenic neighbourhoods in the Comox Valley. 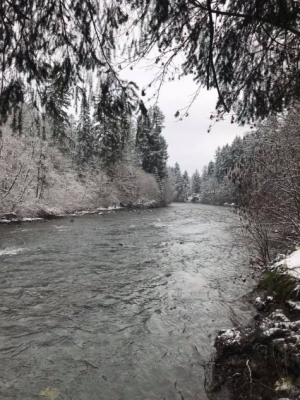 Vancouver Island has the mildest climate in Canada, making it possible to do almost anything in the winter that you can do in the non-winter months. Many golf courses are open year-round, as are bike trails. It is still mild enough to enjoy boating and fishing activities. Dress appropriately for the weather and you can enjoy your favourite recreational activities twelve months of the year! December is a time of year in the Comox Valley where golfers, hikers, boaters and the daily walkers are still out enjoying the outdoors. But traditional winter activities are also just a short drive away. One of the highlights of December is the opening of Mount Washington, which features a variety of activities for all ages and experience levels. Enjoy downhill and Nordic skiing, snowboarding, snowshoeing, tobogganing, and snow tubing. Opening day for alpine skiing was Dec. 7 and Nordic skiing opens on Dec. 14. If you are visiting from out of town, come a take a drive through The Ridge. Homeowners in this master-planned community are just a few minutes from all of these amazing Comox Valley activities and points of interest. You will love the mountain and ocean views! 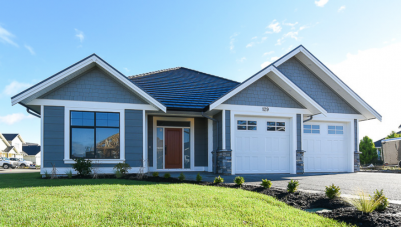 There are a few new, pre-built homes for sale in Phase 2 at The Ridge in South Courtenay - one of the most scenic neighbourhoods in the Comox Valley. 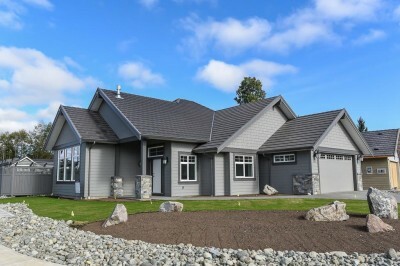 New homes have been selling very quickly in this sought after neighbourhood, thanks in large part to the amazing views, the tranquility of the area and the close proximity to amenities in the Comox Valley. Three of The Ridge's preferred builders currently have homes for sale in Phase 2: Lawmar Contracting, Brando Construction and Candor Developments. Grand Legacy Builders has one lot left in Phase 2 on which to build a new home. All of the preferred builders carry third-party home warranty insurance on all new homes built. This includes two years on labour and materials, five years on the building envelope, including water penetration and 10 years on the structure of the homes. British Columbia carries one of the strongest construction insurance coverages in Canada for new homes. Preferred builders at The Ridge bring many years of experience to their work. This, combined with the New Home Warranty Insurance, gives buyers peace of mind when buying a new home at The Ridge. Additional new homes will be coming to this beautiful housing development in mid-December as the road works and utilities will be fully installed on Phase 3, allowing for 43 more new homes to be built. Contact the developer today to register as a “prospective client” and receive up-to-date information on the new residential lots for sale in Phase 3 at The Ridge. 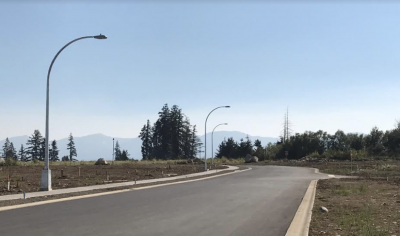 The new housing development at The Ridge in South Courtenay on Vancouver Island continues to grow as they now have Phase 3 under construction. 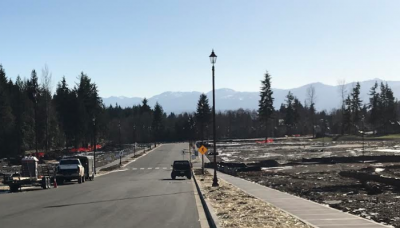 Paving and street lighting installation is expected to be completed this month, and registration on the 48 residential lots in Phase 3A will be completed by mid December enabling construction to begin on new homes. The zoning at The Ridge allows for secondary suites to be built in all single-family homes, which has allowed families to build in-law suites, nanny-suites and mortgage-helper rentals. 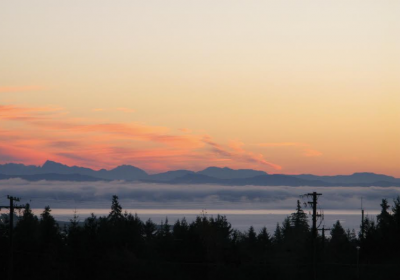 These building lots feature views of the Comox Glacier, the surrounding and mainland mountains and ocean views of Comox Bay. Over 100 new homes have been built in Phases I and 2 and more homes are under construction. At The Ridge, you can choose to work with one their preferred new home builders to build your home, or bring your own builder. Once you choose your residential lot and your builder, you are on your way to being welcomed by your fellow residents in this friendly neighbourhood. You'll enjoy living in this quiet part of the Comox Valley, close to the beach, walking trails and Courtenay city centre. Located in South Courtenay, on Vancouver Island, The Ridge is a welcoming neighbourhood close to everything in the Comox Valley. 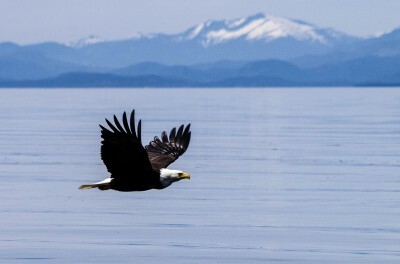 Interested in finding out more about this beautiful part of Vancouver Island? Contact the developer to register as a “prospective client” and receive up-to-date information on the new residential lots for sale in Phase 3 at The Ridge. The new housing development at The Ridge in Courtenay continues to grow as they now have Phase 3 under construction. Paving and street lighting installation is now nearing completion. Registration on Phase 3A, which consists of 48 residential lots, will be completed by mid-December, and new homes will be under construction once registration is complete. Zoning at The Ridge allows for secondary suites to be built as part of all single-family lots in this development. 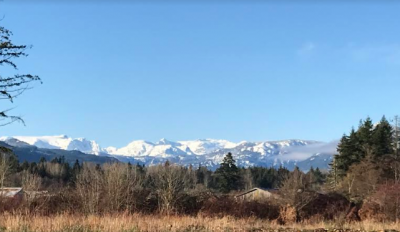 These south Courtenay building lots feature views of the Comox Glacier, the Island and Mainland mountains, and ocean views of Comox Bay. Almost 100 new homes have been completed in Phases I and 2 and more homes are still under construction. Purchasers at The Ridge can choose to work with one of their preferred new home builders to build a home, or choose their own builder. 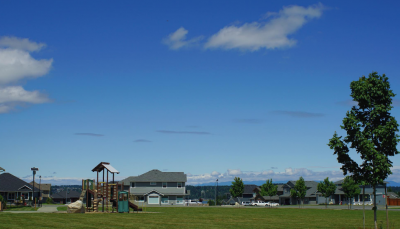 Residnets enjoy living in this qiet community in the Comox Valley - The Ridge is close to beaches, walking trails and Courtenay city centre. Located in South Courtenay, on Vancouver Island, The Ridge is a welcoming neighbourhood located close to everything in the Comox Valley. Interested in finding out more about this beautiful part of Vancouver Island? Contact The Ridge to register as a “prospective client” and receive up-to-date information on the new residential lots for sale in Phase 3 at The Ridge. 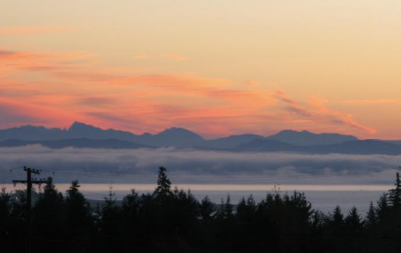 Are you looking for a new home in Courtenay in the Comox Valley on beautiful Vancouver Island? 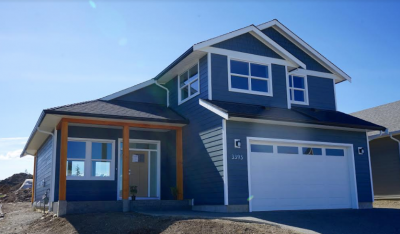 Southwind Developments, an experienced builder with more than 20 years experience building new homes on Vancouver Island is now building 20 homes in Courtenay. 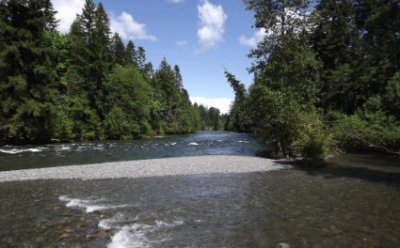 These new homes are located on a property adjacent to the nature sanctuary known as Ruth Masters Park, and they are also very close to the Puntledge River. 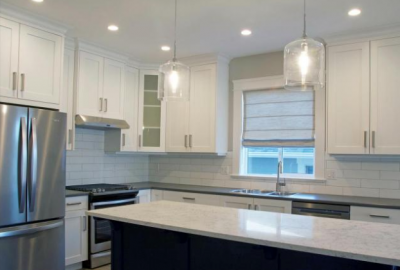 This new home development is walking distance to both Courtenay Elementary School and Ecole Puntledge Park Elementary School, as well as Lake Trail Middle School. These homes are situated on lots lareg enough to allow storeage of your recreational vehicles ion your property. 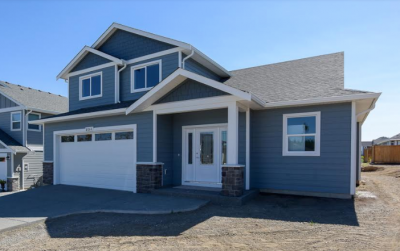 There is currently one single-storey home (aka a rancher or bungalow-style) home completed and ready for sale and for occupancy. You can be moved into your new home before Christmas. This new 1,950 sq. 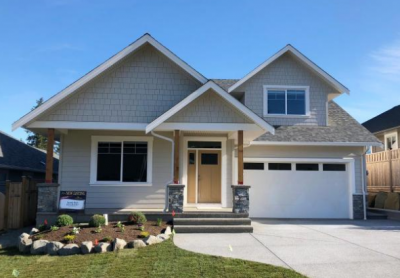 ft. home has a very large walk-in closet in themaster bedroom, a total of 3 bedrooms, 2.5 bathrooms and one of the largest backyards of any new home being built in the City of Courtenay. This home is priced at $589,900 + GST. A second home, approximately 1,600 sq. ft. in size is at the lock up stage and will be finished by the end of December. Now is the time to puechse and upgrade the interior package. 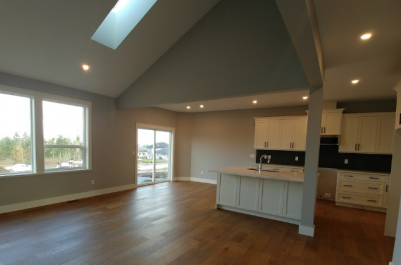 Call now to find out more details on this new spacious one storey home for sale in Courtenay, BC.